Water supply services in Moldova’s rural areas are still far below the level in cities or villages in other European countries: more than two thirds of the population rely on water from shallow wells, which is usually not safe for drinking. Where public water supply systems exist, they are often poorly managed and services provided are of low quality. Improving water supply in villages is the main focus of the ApaSan project. The main strategy of the project is to enable local municipalities and communities to develop projects and management solutions for better water services in their villages. ApaSan supports rural municipalities and communities to invest in their water systems. Until 2018, ApaSan will have helped building new water supply systems in 40 villages, serving more than 67’000 people. The water supply systems built provide continuous supply of safe water in metered connections to the premises. Management is done locally through the community or municipality in most cases; some systems are also managed by regionalised urban utilities. In low-income countries, raising the funds necessary for infrastructure development can be a struggle, especially in rural areas. In the case of water supply, engineers have to deal with the high demand for drinking water, legal frameworks that may not be well-adapted to rural contexts and a lack of funds. This makes choosing the most cost-efficient design of crucial importance in order to reach as many people as possible with the available resources. Compromises between country norms and actual needs have to be found (at least temporarily) in order to improve people’s quality of life and avoid health problems related to the consumption of contaminated water. The document below describes Skat’s practices through the ApaSan project in the context of the actual norms and general practices for the implementation of WSSs in Moldova. An important element from the water and sanitation infrastructure projects implemented within the ApaSan project was the systematic request from each beneficiary population (including local public authorities) to substantially contribute to construction costs. The management of the contribution has been shown to be tricky, especially as homeowners tend to have only few trust in their public authorities. The document below presents two approaches used during the ApaSan project to tackle this issue. ApaSan has supported communities and local public authorities in all villages to establish structures for sustainable operation and management of the systems. The management model used in most villages was community based operation (Water Consumer Association, WCA). It was continuously improved throughout the project and is also suitable for small municipal or inter-municipal enterprises. Local management will be the key element for the foreseeable future for improving water services in rural areas. ApaSan also supports the Congress of Local Authorities of Moldova (CALM) to establish a service centre that provides technical assistance to small water operators (SOMAS), thus contributing to the sustainability of locally managed water services. 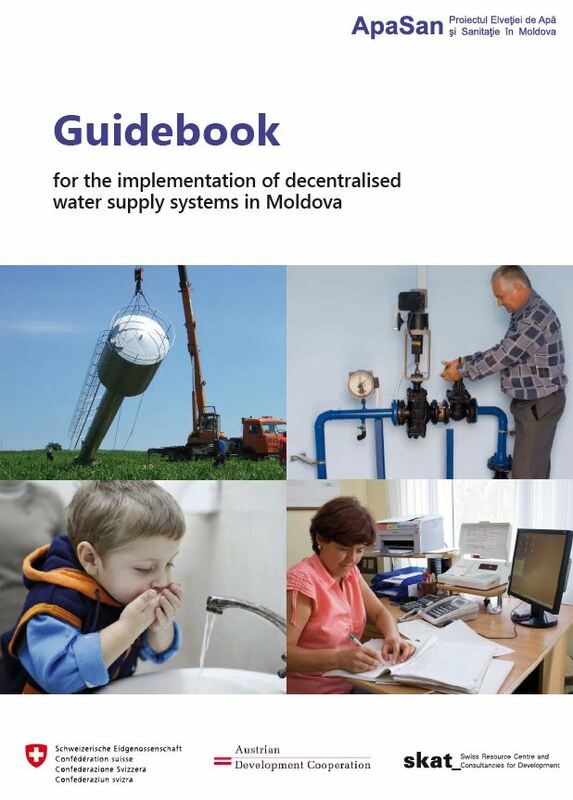 The Moldovan National Program for implementation of objectives derived from the Protocol on Water and Health sets a target of having effective water safety plans (WSPs) in all agglomerations having more than 5,000 inhabitants by the year 2020. To support the effort and develop a long lasting expertise in WSPs implementation, Skat supervised WSPs in two Moldovan villages. Methodology and lessons learned from this experience are presented in the following document. The guidebook summarises ApaSan’s experience with decentralised technical solutions and community based management for rural water supply. It provides guidance for implementation, and collects all documents and tools that may be useful in implementation. Local water systems based on spring water catchment provide generally good water quality and are cheap and easy to manage. However, in many locations in Moldova, spring water is not available and groundwater or surface water needs to be used, which usually needs to be treated to be safe for consumption. ApaSan has introduced technical solutions for treatment of ground water that have low operating and investment requirements and are thus well suited for small water systems with local management. Relatively high iron and manganese concentration levels in the groundwater are common in Moldova. Those compounds, even if not directly dangerous for health, both do pose aesthetic and technical issues. The most common treatment technique, consisting in aerating the extracted water and filter it, being thought to be too labour intensive and expensive to be sustainable in the context of rural Moldova, Skat, through the ApaSan project, proposed the less well-known but proven to be efficient in-situ technique for iron and manganese removal. The in-situ technique, consisting in reinjecting oxygen-enriched water directly into the aquifer, has been implemented in two Moldovan villages. The present paper describes the experience done in both villages and the technology’s suitability and sustainability in the context of rural Moldova.